Phil Blythe, Professor of Intelligent Transport Systems at Newcastle University and Chief Scientific Advisor, Department for Transport. Electric vehicles may still seem a distant future for many in the UK, but with government commitments to cutting emissions by 2050, we are looking at 60% of new car sales being ultra-low emissions or electric by 2030. The government is providing more than £600 million into supporting the electric vehicle market over the next four years and Newcastle is at the centre of this drive. 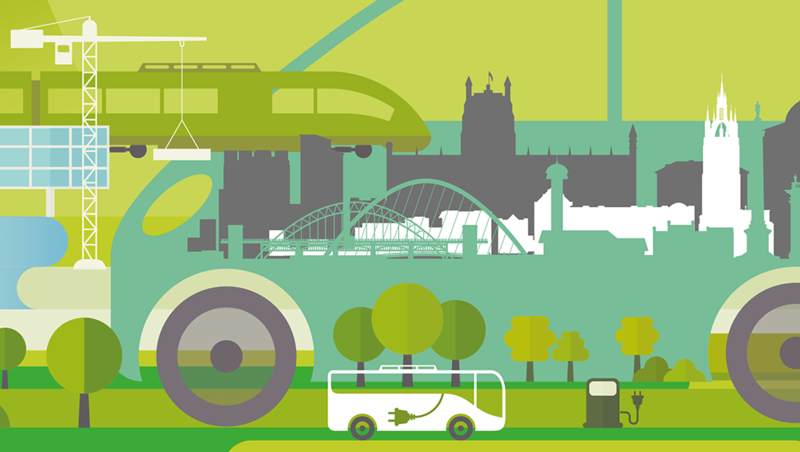 Newcastle City Council and the North East region in general is the national leader in the provision of infrastructure for electric cars, and at the university we are spearheading global research into electric vehicle use. The research we’ve conducted, combined with work with the European Union, US and China, has really showed that while there are concerns on the cost of electric cars and their range, if you have the infrastructure in place, the use of electric vehicles soars. In Newcastle we have installed more than 79 electric vehicle charge points through the city and more than 1,400 throughout the North East. The result of this investment is that the North East, despite being one of the less well off areas in the country, has the highest use of electric vehicles per head of population in the UK. motorists to invest in an electric vehicle. A recurring big issue we’ve seen with our studies, is that many people have real concerns on the distance range of the vehicles. However, the average electric car, such as the Nissan Leaf, has a range of around 100 miles between charges. The average motorist only drives (20km) 12 miles a day, so in short, electric cars have a perfectly sufficient range for most drivers, most of the time. Once people see electric vehicles, use them and realise that for most journeys, usage of an electric vehicle is good enough, they begin to realise that it is a possible vehicle of choice. Having the charging infrastructure in place also drops some of those barriers relating to the range of the vehicle. If people know there is an infrastructure should they need it, they are more inclined to invest in an electric car. That’s exactly the behaviour we’ve seen in the North East. Working with my research team at the University, we have run an in-depth study on creating a rapid charging network on the UK’s TEN-T road network, and looking at the impact of this on electric vehicle usage. The RCN project supported by partners including Nissan, BMW, Renault, VW, Zero Carbon Futures and ESB, saw the installation of 74 rapid chargers over 1,100 km along major UK and Irish roads, linking five sea ports and five international airports. The Rapid Charging Units can charge any electric vehicle with an empty battery to about 80% full state of charge in less than 30 minutes. The research from this project is being shared with the rest of the EU, with the findings informing our future strategy for creating a business investment case for a rapid charging network across Europe. Initial findings show that these rapid charging units have significantly influenced buying habits, 68% of the RCN respondents indicated that they would not have bought the electric vehicles without rapid chargers available and over 90% of the respondents indicated that the availability of a rapid charging infrastructure increases the likelihood of purchasing an electric vehicle as their next car. What does this mean for our Northern transport strategy? Electric car ownership is currently increasing by over a 100% every year and although we don’t expect this trend line to remain so steep, as prices fall and technology improves it will be a core element of our road transport system, not in the distant future but in the near future. Any transport planning for the North needs to have a strong infrastructure in place for electric cars, with charging units throughout cities and most importantly, further investment in the rapid charging network, which will play a key part in supporting the growth and use of electric cars in the North. To this end we are likely to see rapid charging electric vehicle filling stations installed in Sunderland and Newcastle during the next 12 months.